No, I haven't dropped off the face of the earth, although it sure feels like it. I've just been busy as ten dogs with work – two 300-page manuals, one due last Monday, the other next Monday, with back-to-back business trips over the next two weeks. I've been pulling 12-hour days for the last 3 weeks, and was barely aware that there were holidays in there. No cookie-baking frenzy for me this year, and our Christmas dinner was a decidedly stripped-down affair. Not my choice, but I'm glad to be so gainfully employed, so you won't catch me complaining. Much. Life should get back to manageable towards the end of the month, and maybe I can start cooking and posting again. 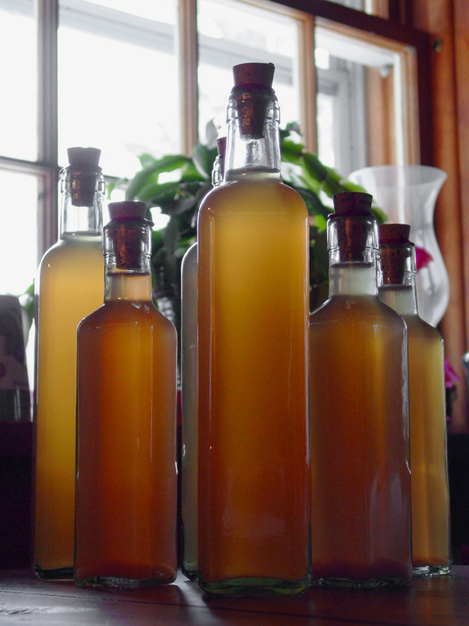 In the meantime, here's a picture of the Quince Liqueur I concocted (a byproduct of my autumn quince adventures). These little bottles made some very nice holiday gifts. It's quite tasty – full of quince perfume, lightly tart, not too sweet. I've been sipping it chilled, plain, but I suspect there's a fine cocktail to be devised with it. Oh, and a quick report on the Menu for Hope: this year's drive raised just over $90,000! I can't wait to see who scored my jam sampler. The drawing's on January 9th. 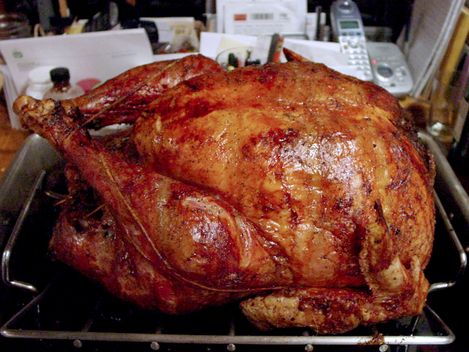 Here's a belated wish to all for a 2008 filled with good food, good fortune, and good health. And here's a prayer for an honest new president. Or at least one who speaks English. I don't mean the turkey. It was perfect, all 21 pounds of it. Actually, all of the food was perfect except maybe the stuffing, which was tasty but a little bit dry. Nope, no family mishaps or uproar; my family is the best. My husband shopped, rearranged furniture, made pie, cleaned up after me. The kids ironed linens, set the table, peeled potatoes. And my friends: my friends saved the day. No, “oops” because just as everybody was getting settled in and jolly, and I was about to enter the sprint for the finish that is the last hour of making Thanksgiving dinner, as I was chopping mirepoix for the brussels sprouts, being simultaneously tormented, entertained, and distracted by one of my hilarious friends, I very nearly severed the tip of my left pinky. Lucky me, I only got about halfway through. I thought so. A certain amnesia always inspires me to put them on the menu, but I always end up leaving them uneaten on my plate. And I'm not alone. They seem to be the one item that routinely gets scraped from plate to compost, and the plastic tub of leftovers ends up growing a fascinating culture at the back of the fridge. Not so surprising, really. I mean, come on: boiled onions, butter, flour, milk, salt, pepper – a little nutmeg, if you're lucky. Sounds like a perfect definition of bland. The last time I hosted Thanksgiving dinner, I tried a new approach to creamed onions. They were all eaten, and I'm quite certain the bowl was licked clean (and not by the dog). The key difference lies in roasting the onions.